Gathering at the River by Chris Clark, contemporary. 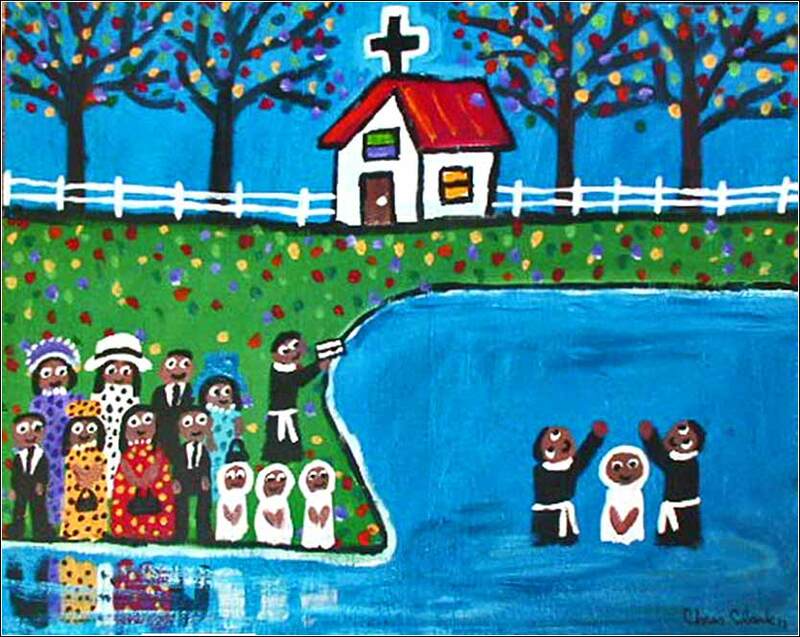 Clark, a primitive or “outsider” artist, has limited vision, resulting in an uninhibited use of color, bright and upbeat. A bright and happy contemporary worship video, with lyrics, to get us feeling good this week. Baptism of Christ (detail) by Giotto (Giotto di Bondone), ca. 1305. 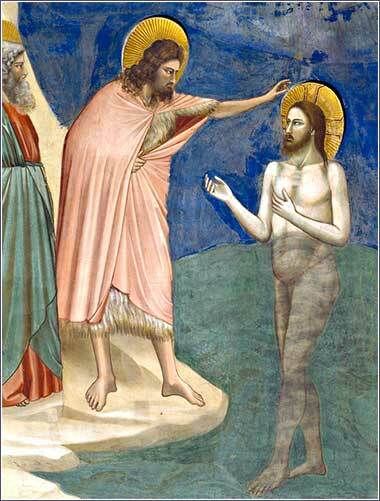 Giotto was a true pioneer and his treatment of draped cloth was a revelation to the art world. Still, we can see the absence of modern technique in the awkward rendering of John's feet on the rocks. 10 night and day beyond all measure asking to see of you the face and to put in order the needs 2Alt. deficiencies. of the faith of you? These verses wrap up the first section of the epistle, a long sermon of encouragement, praise, and love, with some subtle guidance on how to evangelize, using the technique of indirect hortatory. Paul's unabashed emotionalism reaches a crescendo, especially when verse 8 is included; one might read v.8 to imply that Paul's very life depends on the faithfulness of the readers! Yet if his hyperbole makes him sound like a lovesick Victorian suitor to us, is it his overstatement, or the cynicism of the modern eye? If we look at Christ's teaching, we must accuse ourselves and admire Paul. Christ does not call us to love Him with half our heart. “Love the Lord your God with all your heart and with all your soul and with all your strength and with all your mind;” (Luke 10:27) How many people can we say follow that teaching? That Paul has such enthusiasm for the future, despite the sufferings about which he has warned and continues to predict, has a special meaning. Remember, this is the first epistle — actually, the first book written in the New Testament — and can be seen as the establishing document of Christianity, that is, the church in the age after Christ's ascension. The “gods” whom the Greeks were accustomed to worship were not good, and they did not care about people very much. They certainly were not thought to change their behavior in response to prayers. They were bound to the Fates, just as human beings were. People did not love them; they did worship them and sacrifice to them, hoping to minimize the damage from their seemingly incoherent and random whims. If you have ever watched Lawrence of Arabia, remember what the Muslim Arabs remarked when a man, whom Lawrence had courageously rescued from the desert, was shot? “It was written.” The man's death was ordained. Lawrence was wrong, or at best foolish, to try to save him. Such fatalism infuses the doctrine of every religion on earth, except one: and we see, in 1 Thessalonians, the creation of this trait — the unique optimism of Christianity. Any person, no matter how poor or humble, no matter how evil he has acted previously, can find salvation; and he doesn't need money, or power, or elaborate ritual to do it. It is accomplished by faith, by love for his fellow man and by the optimism itself. For in Christian doctrine, hope is considered a desirable and even necessary attribute, to be cultivated in one's own life and encouraged in others. One can only surmise the effect this had on the Greeks of Thessalonica. This was Good News, indeed!